Vancouver, British Columbia – February 1, 2017 – A.I.S. Resources Limited (TSX – NEX: AIS.H) (the “Company” or “AIS”) is pleased to announce that results of sampling programs at Guayatayoc Salar and Laguna Vilama have been received from the Australian Government National Measurement Institute (“NMI”). Vilama sample 1626 (V18) returned 820ppm lithium (0.082% Li), 7 320ppm potassium (0.732% K) and a magnesium to lithium ratio of 7.9:1. The first pit sampling program of 34 sample pits at Guayatayoc are complete and samples have been sent to NMI for Analysis. Results are pending. The company is extremely pleased with these exploration sampling results. This is the first step to creating lithium and potassium isobars and the ground work to locate the sonic seismic and drill hole programs. Samples collected at Guayatayoc and Vilama have lithium values in the range that would be considered exceptionally commercial along with very high relative potassium grades. Note that a NI 43-101 Report has not been issued and that readers should be cautioned that the inference of commerciality relates only to the grade and not to any resource estimates. The magnesium to lithium ratio is very low at Guayatayoc which implies a lower usage of Slaked lime and Sodium Sulphate to remove the magnesium from the brine. Phil Thomas, COO and Exploration Director and Marc Enright-Morin, CEO accompanied by local geologists visited the Guayatayoc Salar and Laguna Vilama in November 2016 and conducted a sampling program taking a total of eleven samples of which two samples were duplicated making a total of nine sampling locations. Nine one litre bottles were rinsed out in brine from the sample pits and were immersed by hand to the middle depth of the pit at an elevation of 3,410 metres in Guayatayoc and 4,451 metres in Laguna Vilama. Samples were then prepared for shipping. The samples were sent to the Australian National Measurement Institute (“NMI”) in Sydney, Australia which is one of the highest rated analysis institutions in the world. It is responsible for Australian measurement standards. 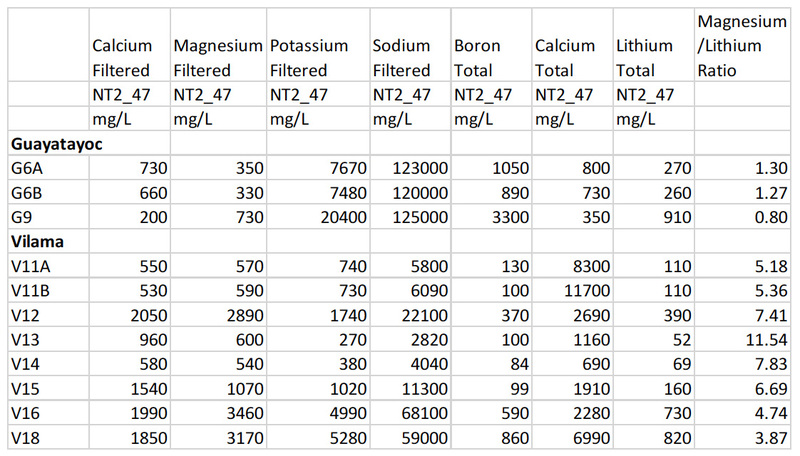 The above analysis is very encouraging with ph and sodium values in the ideal range. Phillip Thomas, BSc Geol, MBusM, MAIG, MCIM MAIMVA, CMV MCIM, a Qualified Person as defined under NI 43-101 regulations, has reviewed the technical information that forms the basis for portions of this news release, and has approved the disclosure herein. Mr. Thomas is not independent of the Company as he is an Officer and a shareholder. A.I.S Resources Limited a TSX-V listed investment issuer, was established in 1967 and is managed by experienced, highly qualified professionals who have a long track record of success in lithium exploration and production and the capital markets. Through their extensive business and scientific network, they identify and develop early stage projects worldwide that have strong potential for growth with the objective of providing significant returns for shareholders.